Although this isn’t the first sweater I’ve begun, it is the first one I’ve finished. I’m still working on that dang Einstein coat. I must admit what at first seemed like a good idea (miles of garter stitch) quickly turned into some form of tedium. I’ve got the body of the thing done, but I have to do the sleeves to finish it. Anyway, back to this green beauty. It’s made out of Cascase 220 which I must tell you I like very much. The picture doesn’t do the yarn justice – it has these marvelous flecks of blue and yellow mixed in with the yarn, but the effect is very subtle. I’m glad I got this sweater done. I learned a lot of things in the process, the most helpful being those things I would do differently now that I know about them. But it is what it is and it will always be special because it was the first sweater I ever finished for myself. Knitting & Crochet, Pictures sweater. permalink. Groundhog Day … yeah, right …. Congratulations. Looks like it turned out lovely. I love Cascade 220. They have some of the best colors. I’m especially fond of some of the Pastaza. OMG Boyd, this is spectacular! I can’t believe it’s your first. It looks like you’ve been doing this for years. I am VERY impressed, and want to see a photo of you IN this sweater! Simply stunning, Boyd. 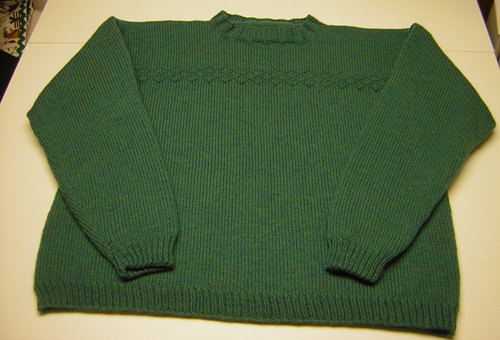 Good thing I don’t live closer or I might do a Sweater B and E.
It is Gorgeous Boyd! Congratulations on completing your first sweater! Just beautiful – LOVE the colour!